A couple of days ago, Pepe called Meghan at the cookhouse. He is tending sheep on our permits on the Red Desert. I heard Meghan say, “gallinas?! domesticados? !” (chickens?! domesticated?!). Apparently, someone turned loose some hens and one rooster. Meghan called the BLM Range Conservationist, who tried, unsuccessfully, to catch them. The Chain Lakes allotment is checkerboard, with the Wyoming Game and Fish Department owning every other section. Mike, the Range Con, then turned the matter over to the Game and Fish. They are fowl, if not fish. What’s amazing is that they haven’t been eaten by coyotes! 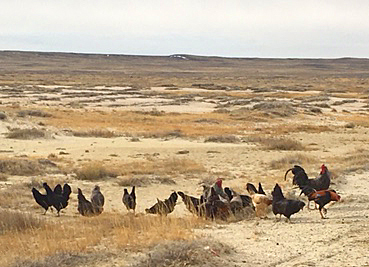 December 1st is the on date for our winter sheep grazing allotments on the Red Desert, north of I80 and Wamsutter, Wyoming. The sheep walk a five-day trail from our late fall pasture, Badwater, to the checkerboard Chain Lakes allotment, with the private owned by the Wyoming Game and Fish Department. It also serves as critical winter habitat for antelope. We maintain the water and the fences, and provide “boots on the ground.” One band of sheep winters in Chain Lakes and two move on to the aptly named Cyclone Rim allotment. A few weeks ago, this blog showed photos of our search for water holes on Cyclone Rim. The bucks will be turned in with the ewes in a few days, in order to bring those spring lambs. To make sure the ewes are in optimal condition, we decided to worm them in advance of bucking. On this day, it was coldish and windyish, but certainly a relatively pleasant day.